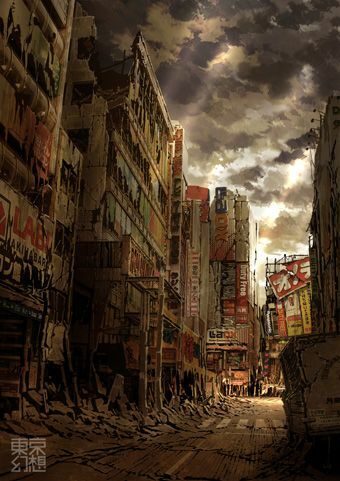 Tokyo has been ravaged. It was meteors or earthquakes, tsunami or nuclear holocaust, though the cause hardly matters- no one’s left alive to remember it anyway. 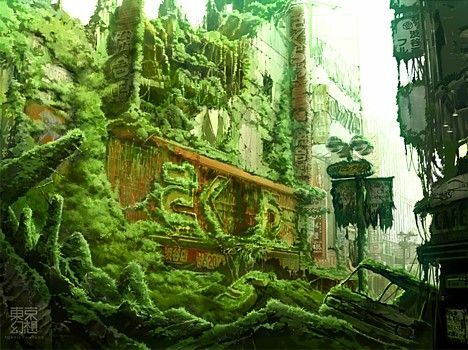 The apocalypse came and killed everyone, leaving only bits of our cities behind. 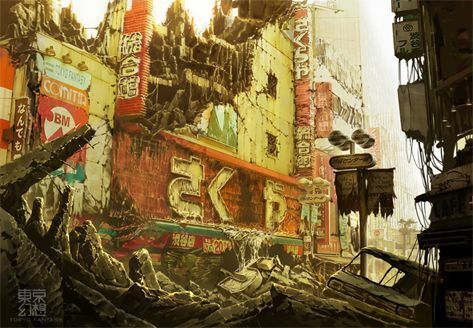 Tokyo Genso is the site of a Japanese game artist who is passionate about the apocalypse. 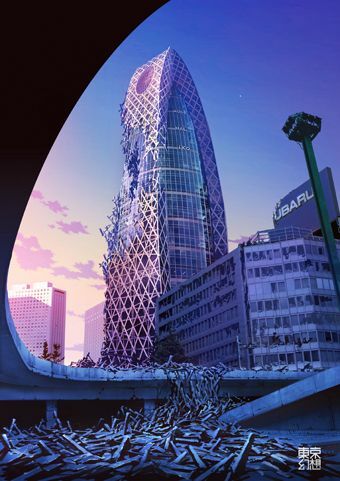 His site features huge amounts of his often excellent art, occasionally describing his destructing technique, and show-casing his work in magazines like ‘Liberal Time’ and at otaku conventions. 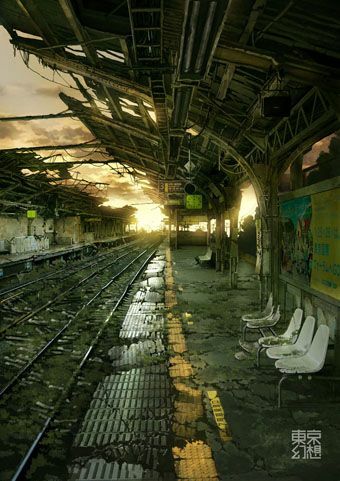 He takes photos around Tokyo, and via Photoshop kills all the people and ages the city through various natural disasters. Recently I’ve become more interested in this kind of of digital manipulation, also called digital painting. I use some basic tools in Photoshop and like what I see. 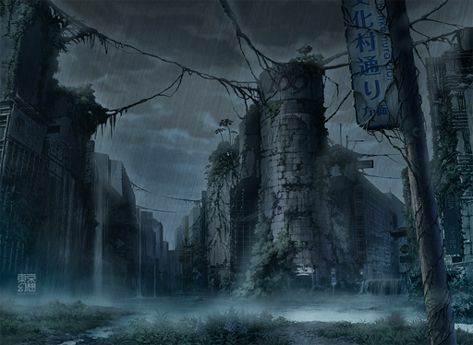 At some point I’ll try my hand at destructing environments, but for now let’s all enjoy what Tokyo Genso (Tokyo Fantasy) has managed to conjure up for us. 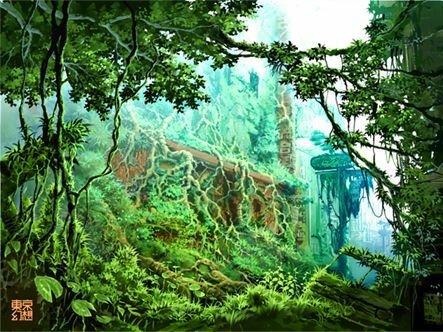 See more Fantasy Ruins in the gallery. Fascinating pictures. Reminds me of the last scene in “Planet of the Apes”. 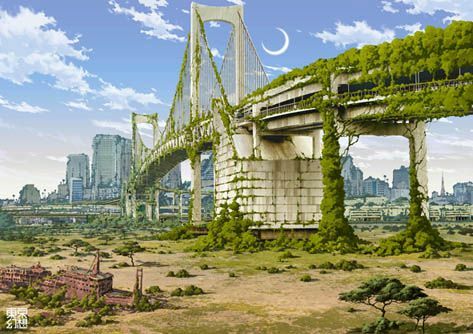 Makes me wonder what it will be like for future people (or whatever) to explore the ruins of our civilization. 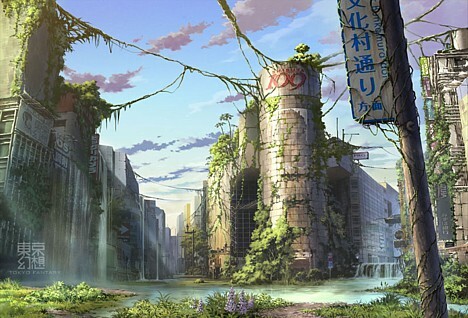 … Maybe fun for the explorers, but the thought of our civilization in ruins is a little depressing. I guess it will come to pass someday, though. “Nothing lasts forever but the earth and sky,” to quote an obscure rock lyric (Kansas’s “Dust in the Wind”). On the bright side, maybe the explorers will be our descendants who have moved on to a better way of living. Too bad I can’t access the Tokyo Genso site through my company’s URL filter. One web design suggestion: It might be helpful to tunnel-vision readers like me to put a link to the featured site in the lead paragraph. I had to mouse around a bit before I found the link farther down, at about the same time I realized that the illustrations were links to the originals. Good call on the linking David, I changed the first words to be a link to his site. Though actually his site is not set out too well for people only interested in the ruins posts, no tags or categories, you have to scroll down through many pages of him surfing, doodling, and taking pictures of his hair to get to the ruins stuff. Though perhaps that’s his intention? I’ve got a few tutorials for creating this kind of destruction that I’ll be working through at some point, perhaps will post here if what I can make is any good. Future ruins can be quite spectacular. I wonder if I could get interviews with the designers/cinematographers of movies like I am Legend or Terminator Salvation. Would be quite a catch if I could. Good job on the link, Mike. Thanks. 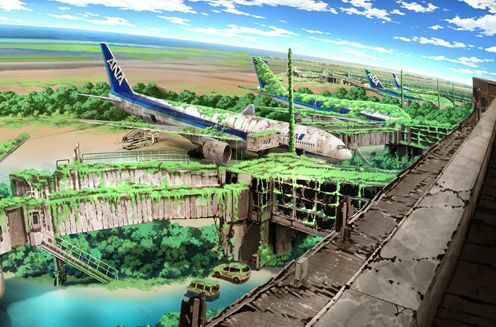 Looking at these pictures again, I’m reminded of backgrounds in high-quality anime. 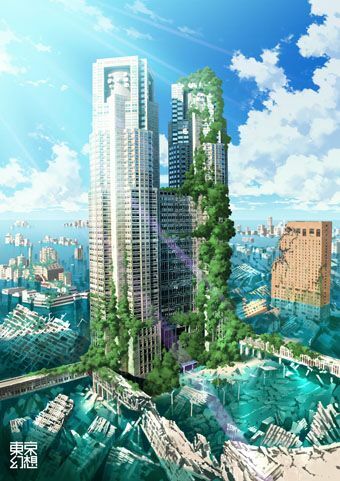 You’re saying Tokyo Genso starts with photographs of the actual locations and the whole effect is the product of photo manipulation? That’s impressive. I’m curious about those tutorials you mention. If they’re on-line, would you mind sharing the links? There are lots more on that site too, for everything really. Very helpful. If you go through with one of them I’d be very interested to see what you come up with. 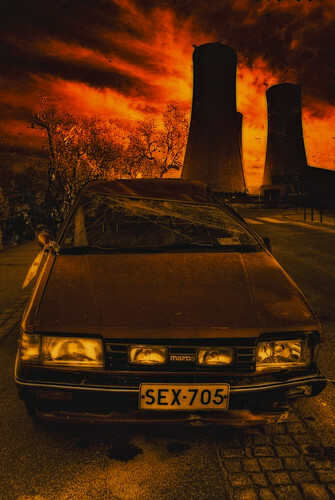 as usual great post and nice work for the links to the PSD site just wasted an hour trying to manipulate an image i got of an abandoned car a few weeks ago but not sure if my photoshop skills are up to destroying Tokyo, could this lead to a whole new generation of armchair haikyoists! J-eye, you’re alive! Every now and then I check in on your site looking for your ruins shots, but you haven’t posted anything new for decades. Is it the g/f, disapproving? As for time wasted trying to destruct stuff, I spent 4 hours following the tutorial. It actually looked pretty good at the end- I’ll probably post it today. Of course I just followed his directions exactly, with the same images. Looking at yours- wow! Awesome. Not at all feeble. Still alive barely, switched jobs a few months ago which has given me little time to get out and about and so tending to post straight to flickr these days, love the NYC shot you did, four hours, it would be good to see a side by side comparison of the tutorial pictures, it will be interesting to see original shots, will endevour to try get one myself, maybe you should get your readers to destroy an area around where they live.